A small island reachable by a short boatride from the beach of Candelaria town in Zambales was visited by Tutubi twice alredy. You can walk around the whole island in about 30 minutes and enjoy the are pinkish sand of the small island, more like an islet. From Manila (Victory Mall Caloocan near Monumento), take Victory Liner bus to Sta. Cruz, Zambales and drop off along the highway going in Candelaria (Dawal, fare: PhP430.00) travel time is 6 hours. Rent a boat to take you to Potipot Island. costs more like PhP100.00 per head. Cottage rentals are available, you can bring food and drinks to the island. How do I get to Sun Bloom resort via public transpo? We will just ride a bus from Manila. I heard we'll have to get off where Dawal is and just walk going to Sun Bloom. Is that true? Just wanted to help Ate Mercy from Sun Bloom and the tourists who want to go to Potipot. Hello, help naman please, we are planning on staying at Dawal Resort and we were wondering where can we eat outside Dawal, kasi mahirap magluto lagi and I'm sure pricey sa Dawal. Saan yung floating restaurant and estimated price of food there? Thanks! 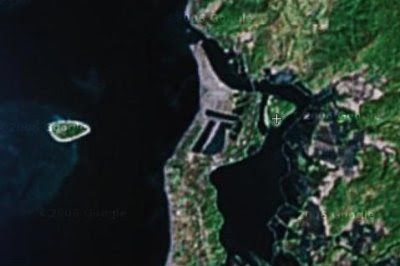 ate ilan po ang total area ng putipot island? need lang po sa project namin> thanx po!! When we went to Sun Bloom Resort last 28 Feb 2009, we asked about the floating resto. According to Ate Mercy's caretaker, Kuya Allan, the floating resto is no longer there. Nasira daw sa typhoon last rainy season. I'm not sure if ginagawa un floating resto ngayon. can anyone give a rough estimate as to how much money one person would need? katrina, lots of details missing in your question here. boats rides to potipot are not that expensive (depends on your negotiation skills) since it's very near the beach and boatmen can leave you there and fetch you later. is there any transient houses aroud the area? 5. If people are feeding the fishes, please don't swim where the fishes are. You can check them out underwater but please don't swim right through the fishes. You're disturbing them. To the owner of the island (if you're reading this), kindly do something about these. We're paying Php50 (day tour) or Php100 (overnight) to be on your island. You can put posters/tarps on the island to remind people what not to do. You can impose rules like these. You can even ask the rangers to penalize tourists who do these horrible things. we're planning to go there sometime soon, is it ok to just put up tents instead of renting a hotel room? does the island have facilities like CR and tables? Are they for rent (tables chairs) and if so, how much? anonymous, there's an "entrance fee" of P100 (updated information supplied by an officemate of mine who went there recently). Cottages and CR/toilets also available. No info on tables rental rates but yes, they can be rented. hello,do u have an idea as to how it is in the island during holy week? do you think it would be crowded? what are the feedbacks from the boatmen? pano po papuntang POTIPOT from Baguio? thanks.. I'll be there this weekend. i just hope na di pa polluted yung island. You want to got to Potipot via Commute? Ride a VIctory Liner bus at Caloocan and Sampaloc branch only!!!! as in only kasi doon lang yung biyahe!!! anyway ride a bus going to Sta. Cruz via Iba. Tell the conductor or driver to drop you at Dawal Resort or whatever resort you opt to go. kasi nakaka dehydrate talaga. Also SUN BLOCK!! HATS!! and things like: cards, goggles, books, mini fan (battery powered), lots of food, flash lights, garbage bag, tent if you like and pale pang igib sa poso hindi pa kasi maayos water system sa Island so walang water sa shower room. that's all I can share. Madumi ba Island? hmmm slight so please be responsible with your own trash may mga blue garbage drums naman. For us we clean our spot muna before we set the tent. Ang difference ng mag intay ka at sumugod sa terminal ay simple lang -- pag nag pa uto ka bawas budget mo ^_^ . DOn't!!! ride the mini bus!!! more than 7 hours biyahe mo noon. anonymous, thanks for the detailed update. comments like yours are most welcome. may nare-rent ba sa hotel na tent at magkano? magkano na po overnight stay sa potipot island? we are planing to go potipot island but which is more preferable to stay at?package trip or commute?and is it advisable to stay overnight at the island? does the floating restau still exist? me and my friends we're planning to stay at potipot overnight, i just want to ask if it is okay not to rent a room in dawal resort, or any of the resort near there but will rent a boat to potipot? is there a private parking near the island? balak kasi naming mag stay overnight sa island kaso pano ung oto namin?? anonymou, better iquire from nearby resorts for overnight parking rather than leave your car somewhere. saan po a matatagpuan ang potipot gateway resort? hi everyone.i really love to visit potipot island.can somebody tell me the info such as expences going there?im coming from manila,how much is the bus going to zambales that i can arrive to sun bloom resort or any other resort near that?how much is the accommodation on those resort near the potipot island?how much is the boat going to potipot island for 2person?how much is for overnight stay in the potipot island?is it possible to stay there for 2days for example only in the island?is there some accommodation there or some restaurant for our food in the island?coz i like only styay in the island i dont like to go back to those resort near to the island then 2mrw of that i go back to island again.im planning to go there with my wife so we would like to spend all of our 2days in the potipot island so we can use the bach and that nice place.sorry if my comment is so long but plz answer all my questions kindly if uve been there and u know these info coz they r important for me to know.and if u have any contact from the person in the potipot island that renting accommodation there in the island plz let me have that also.will w8 for ur kindly reply.tnx and god bless all. -- If you like all Package Foods,Entrance, Boat Ride,Cottage, and also Van pwede rin po..
Raymond, what island are you describing in your above comment (Nov 9, 2011, 6:42 PM)? Thanks. What is the resort that Grace Armada is managing? Do we need to go to any beach resort before we could rent a boat? Is there someone we could contact for boat rentals??? Grace Armada's resort is at Magalawa Island, ok naman sila, mababait pa nga. hi maybe u can help me... last year kase, we went there. last august i guess.. and plano sana namin na jan ulit sa candelaria mag spend ng semana santa. the problem is, nawala namin yung contact number nung pinag-stay-an nmin. Trinidad beach near dawal... baka naman po pwede nyo maprovide yung contact number po nun.. nag browse po kasi ako, La Trinidad lang ang lumalabas. sa may Iba. Saan po ba pinaka best na resort near potipot island na pwede mag accomodate ng 25 persons? Try checking out Potipot Gateway Resort. Here's the number 09175548554. We can. Check us out! Our website is http://www.potipotgateway.com and give us a call at 09175548554. See yah!